What does it look like when an organization tentatively steps away from an exclusively rules-based regime and begins to attend to both rules and principles? 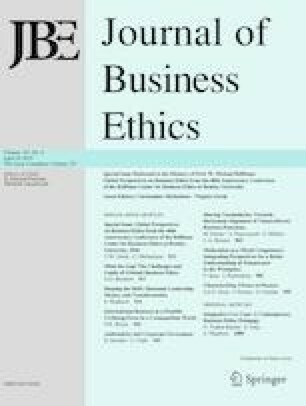 What insights and guidance can ethicists and ethical theory offer? This paper is a case study of an organization that has initiated such a transition. The American Institute of Certified Public Accountants (AICPA) has begun a turn toward the promotion of ethical principles and best practices by adding a “conceptual framework” to its existing Code of Professional Conduct (Code). This conceptual framework calls upon its members to intentionally increase their awareness of significant threats to their compliance with its rules of conduct and to establish safeguards to offset or eliminate those threats. To this end, each member is required to regard every questionable situation, circumstance, transaction or relationship by attempting to view it through the eyes of an imagined reasonable third party. This paper examines this protocol theoretically and practically. First, we frame this analysis within the principles and ethical concepts that inform the professional ethics of accountants. Second, we critique the AICPA’s long-standing rules-based approach to its Code. Third, we examine the new conceptual framework with a view toward its potential for the promotion of a more principles-based approach to the professional ethics of the accounting profession. Fourth, we give attention to the notion of the “reasonable and informed third party,” which has been embedded in the new conceptual framework, and consider how two schools of thought—Adam Smith’s modernist “impartial spectator” concept and Emmanuel Lévinas’ postmodern phenomenology in regard to “the Other”—may offer theoretical support and clarity for this epistemic exercise. Finally, we point out several ways in which the AICPA’s commitment to its new conceptual framework could be strengthened and enhanced.